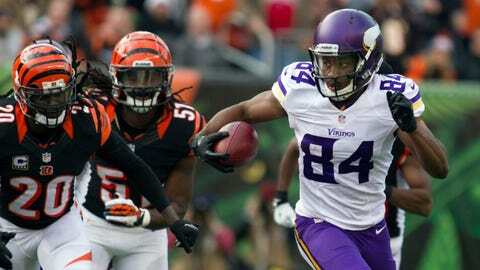 Vikings wide receiver Cordarrelle Patterson has accumulated 1,342 kickoff return yards this season. EDEN PRAIRIE, Minn. — Opponents have tried to stay away from Minnesota Vikings rookie kickoff returner Cordarrelle Patterson for much of the second half of the season. Patterson said he wouldn’t get frustrated because Minnesota still ends up with good field position. Now, four yards away from a team record, he’s trying not to think about the possibilities because of how it would make him feel. Patterson, the talented playmaker Minnesota traded four picks for the right to draft No. 29 overall this year, has accumulated 1,342 kickoff return yards this season. With one game left Sunday at the Metrodome, Patterson has a chance to pass Buster Rhymes for the most return yards in a season in Vikings history. "I know about it," Patterson said. "If I worry about that this week, they probably won’t kick me the ball and it’ll make me mad. I try not to worry about it. Don’t even pay no attention." But Patterson is well aware of the record set by Rhymes in 1985. "Oh yeah," special teams coordinator Mike Priefer said. "He’s already mentioned it to me several times." Priefer didn’t know about the record until he was informed by his son that Patterson was four yards away. But Priefer knows Patterson understands what’s at stake and is proud of his star pupil. "I think with any young player, it’s something to be proud of," Priefer said. "This franchise has been around a long time and has had some distinguished, great returners over the years." Rhymes was also a rookie when he set the record in 1985. Drafted in the fourth round out of Oklahoma, Rhymes had 53 returns for 1,345 yards, a 25.4-yard average. Also a receiver, like Patterson, Rhymes only caught eight passes in his career, which ended after five games with the team in 1986. Patterson, 22, has the chance to make a much bigger impact. His 109-yard kickoff return at the Metrodome against the Green Bay Packers in Week 8 already set an NFL record for longest kick return and tied the unbreakable record of longest play in NFL history. His progress as an offensive weapon has also come around. He’s scored as a returner, receiver and on running plays this season. He has 43 catches for 438 yards receiving and three touchdowns, and 10 carries for 104 yards and two touchdowns. Patterson is also on the verge of leading the league in kickoff returns. He leads Chicago’s Devin Hester by27 yards heading into the final week. Patterson’s 33.6-yard average is the most of any kickoff returner this season with at least four returns. His success has come with its drawbacks. He hasn’t been given as many chances by opponents. "I just listen to coach Priefer, seems like he knows everything back there," Patterson said. "He knows when a team’s going to kick it to me. He knows what to do and if they don’t kick it to you don’t let it stress you out. Just go out and play your game and do what you know how to do." Patterson said he’d like to break Rhymes’ record, but isn’t trying to focus on it. Patterson credits vision to see the field as part of his talent as a returner. "You’ve got to have great vision if you’re a return guy, like Devin Hester and Jacoby Jones," Patterson said. "They’ve got great vision. I like to look at those guys and see how they set their angles up and see how they hit the hole. Being back there you’ve got to have great vision and you’ve just got to run full speed and just hit the hole or the hole will close on you in a second." Gerhart likely out for Sunday: With Adrian Peterson’s status in doubt, Minnesota could be without its top two running backs again on Sunday. Toby Gerhart reinjured his hamstring in last week’s game and has missed both practices this week. Coach Leslie Frazier said Gerhart likely would have to practice Friday to play on Sunday. Peterson was a limited participant in Thursday’s practice. Linebacker Audie Cole (ankle) will miss Sunday’s game. Defensive tackle Letroy Guion (quadriceps) and cornerback Shaun Prater (ankle) didn’t practice Thursday. Linebacker Larry Dean (knee), defensive tackle Fred Evans (knee), safety Harrison Smith (toe/groin), running back Matt Asiata (ankle), cornerback Chris Cook (knee) and cornerback Xavier Rhodes (ankle) were limited in Thursday’s practice. Guard Charlie Johnson missed practice due to a family matter, Frazier said.